The ELOUNDA MARE HOTEL RELAIS & CHATEAUX overlooks the Mirabello Bay on the north coast of Crete, an area of outstanding natural beauty. A hotel of timeless refined luxury; it’s been a member of the Relais & Chateaux prestigious international hotel association since 1988. The charm and character of the hotel is evident to anyone taking an enchanting stroll through the lush seaside gardens of the elounda mare hotel, and its rugged coastline with the many private coves, plateaus, and the gorgeous little sandy beach. Guests particularly enjoy the many lounges, enjoying their aperitif or just a cup of tea on the terrace, in perfectly elegant surroundings furnished in antiques. The St.Marina Chapel’s square, located by the beach and next to the Yacht Club seaside restaurant, is a beautiful area that plays host to many functions and includes an art gallery, a souvenir shop and some boutiques. Accommodation is either in the main building or in private bungalows with seawater swimming pool and is categorised as follows: MAIN BUILDING rooms and suites with balcony or terrace and wonderful sea view. Exuding a sort of sophistication and exclusivity found nowhere else, the elounda mare hotel has an unparalleled reputation for its attentive and personalised service. With its award-winning restaurants, comprehensive leisure facilities and exquisite design, it is the ideal choice for the discerning traveller who seeks a relaxing holiday in a serene and intimate setting. Luxurious marble bathrooms with Airbath® tubs, shower, audio sound, telephone, make up/shaving mirrors, bathrobes, slippers and signature bath amenities. Most suites have a second bathroom with shower and W.C. in the living room. 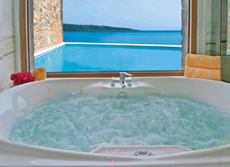 Superior bungalows and 2-bedroom Minoan Royalty Suites have steam showers. The ambiance at the elounda mare hotel is so relaxing and calm that swimming in the large seawater swimming pool or the paddling pool for children next to it, are usually a private affair, even at the peak of the season. There are extended lawns and sundecks along the shore, with sunshades and deck chairs in the most secluded of corners. The crystal-clear waters are just magical, while the private sandy beach has been awarded a Blue Flag for its outstanding services. A Sea-sports facility by the beach includes water-skiing and SCUBA diving tuition, along with pedaloes, windsurfs, and sail-dinghies. A superb sailing yacht and a cruiser are available for charter, in order to explore the nearby islands or sail straight out into the blue expanses of the Aegean Sea. Sports and leisure activities include an AstroTurf ® tennis court, where tuition is available, a fitness room, a table tennis, as well as an indoor area with a sauna and a steam-room. Situated in the sister property PORTO ELOUNDA GOLF & SPA RESORT [at 500m, with complimentary shuttle service], a nine-hole par-3 golf course with golf academy run by a multi-lingual PGA instructor. Further facilities at porto elounda, near the golf course, include a 5-on-5 football pitch with Arsenal Soccer Camps tuition, as well as the Kid’s Ark, a complete childcare centre of unique design. The Creche cares for children aged between 4 months and 4+ years. The activities centre welcomes juniors from 5+ years to 11+years with water slides, table-top games, a trampoline, and a basketball court. Finally, the Teens Club is for 12+ years to 17 years. The Six Senses Spa™, situated in the sister property PORTO ELOUNDA GOLF & SPA RESORT [at 500m, with complimentary shuttle service], offers an unrivalled range of signature treatments that focus on health, beauty, pampering, stress reduction and recuperation using pure, natural and environmentally friendly products. 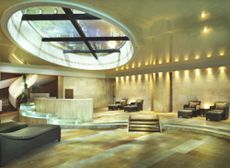 The luxuriously appointed spa spreads over 2,200 m² and has set unique standards in spa design and wellness treatments. It has been repeatedly awarded during its many years of operation. 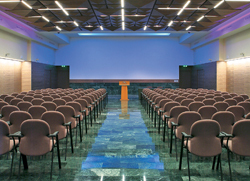 A Conference Room, seating 150 persons, and two smaller rooms, are available for meetings and other events. At the Aegean Conference Centre of PORTO ELOUNDA GOLF & SPA RESORT, with an area of 1500m², five multi-purpose halls are available, enjoying an incomparable view to the golf course and the Aegean sea. Close to the Old Mill restaurant, there is a shop and newsstand. 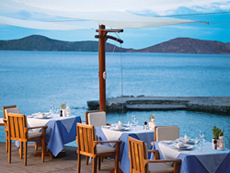 The Deck restaurant in the main building, with a charming terrace offers a superb view to the sea. It proposes a rich buffet breakfast and freshly prepared breakfast dishes. For dinner, enjoy an a la carte menu with local and international specialities, enriched with a rotation of succulent dishes of the day from all over Greece. Guests on half board enjoy their table d’hote dinner here. The Yacht Club restaurant, overlooking the beach, serves lunch daily as well as dinner in the summer months with a varied Mediterranean and seafood menu. The Fish night takes place here on a weekly basis. 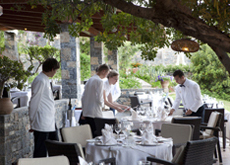 The awarded Old Mill is a fine-dining restaurant with exquisite cuisine based on Cretan tradition. Nestled in the gardens overlooking the sea, it offers a unique dining experience accompanied by music from the piano and the sounds of the waves lapping on the shore below. The "Karavia Bar" is situated in the main building. Our experienced barman will prepare your favourite drink while you enjoy the magnificent views of the Mirabello Bay and the Sitia Mountains. The pianist performs almost every day in the early evening, during aperitifs. Complimentary shuttle service is available to guests who wish to enjoy the Six Senses Spa, the golf course, the restaurants and bars, the Kid’s Ark and further facilities at the neighbouring sister establishments, PORTO ELOUNDA GOLF & SPA RESORT and elounda peninsula ALL SUITE HOTEL at 500m.